Full size / Hole COD18-67 intersected the highest gold-silver grades to date with diamond drilling at the Gold Drop Property. Big news for Ximen Mining Corp. as the company today announced that its option partner hit high grades at the Gold Drop Project in the historic Greenwood Mining District of southern British Columbia, Canada. incl. 232.1 g/t Au, 2,001.1 g/t Ag and >500 g/t Te over 3.13 m from 24.50 m to 27.63 m"
Although this hole was not drilled perpendicular to the strike of the vein, it still shows the exceptional high-grade nature of the vein, possibly being, or leading to, a large quantity feeder system. As Ximen keeps on reminding of the old saying “we drill for structure and we drift for grade”, this hole indicates how potential drifting may encounter the vein in case a production decision can be made in the future. Drilling along veins at slight angles helps in locating possible “ore shoots” and gaining a structural understanding of its vertical and horizontal orientations/extensions for targeted follow-up drilling. Hole COD18-67 was drilled as part of a 11 hole program in Fall 2018, with further assays from 4 holes pending and expected to be released shortly. In December, Ximen´s option partner revealed striking drill core observations ahead of assays, e.g. 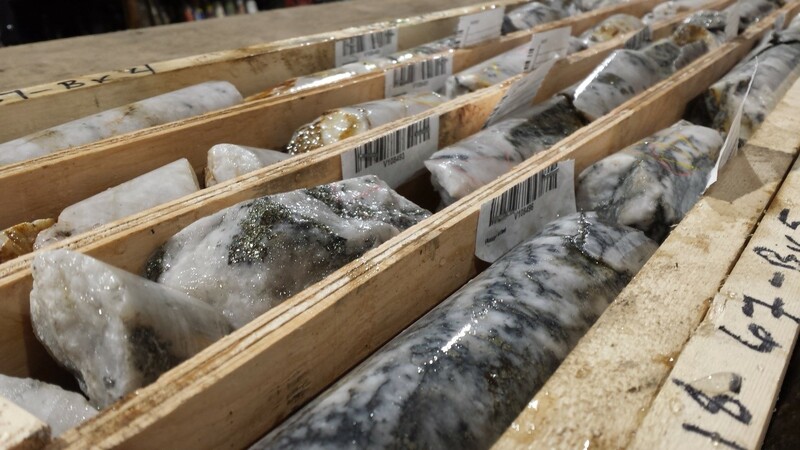 hole COD18-67 intercepting a 8.51 m mineralized interval including a 7.32 m quartz vein intercept (assays announced today), as well as COD18-69 with 9.65 m of quartz separated by mineralized wall rock and COD18-71 with 12.04 m of mineralization (assays from both these holes pending). Full size / See Ximen’s January 14, 2019 News Release for Qualified Person’s review of technical information. Note that true widths cannot be accurately determined from the information available, thus the core lengths are reported. Last year, drilling at Gold Drop started in February/March, so another drill program may start again shortly. With approximately 400 m of the potential 1,500 m strike length (observed visually from surface with soil and rock sampling) now being drilled off, the COD Vein remains open at depth, to the south, and to the north where gold showings are present some 100 m away. What makes the COD Vein so attractive is that it occurs near surface at a vertical depth of around 20 m. Moreover, it is just one of many known high-grade veins on the property. The Gold Drop Property is surrounded by historic production stories within a few kilometers away, e.g. the adjoining Dentonia Property recorded approximately 125,000 tonnes at an average grade of 10.8 g/t gold and 64.6 g/t silver in total historic production from the Dentonia vein (Minfile 082ESE055). The veins on the Gold Drop Property have similar strike/depth ratios as the nearby Dentonia Vein. Ximen’s team member, Alex Mcpherson, worked underground at the Dentonia Mine and thus knows the area well, and how such veins are mined. He has worked on many notable projects across Canada and the United States. In British Columbia, he was also sinking shafts for Bralorne Gold Mines. He has over 60 years of experience in mining and mineral exploration, has done extensive underground work including drifting, stoping, sinking shafts, driving raises, timbering, blasting and much more for a variety of private and public companies. Ximen also has Peter Cooper onboard. He has been involved in 3 successful new gold mine start-ups and has overseen projects from the exploration stage right up to production. He played a significant role in the exploration, pre-production and development of Kinross Gold Corp.‘s Buckhorn Gold Mine located in northern Washington State, close to the Gold Drop Project. For many years, he served as Chief Geologist and then Manager of Operations at Kinross‘ Kettle River Mill, where the ore of the Buckhorn Gold Mine was processed. With the recent closure of Kinross‘ Buckhorn Gold Mine (depleted), the Kettle River Mill (capacity: 1,800 tonnes/day) is currently on care and maintenance, hence Kinross could be looking for replacement feedstock to keep this large mill alive. Full size / Freshly cut drill core from the COD Vein (hole COD18-67). The Gold Drop property covers geologically prospective ground in the well mineralized Greenwood District, and hosts 8 or more known gold-bearing veins or vein systems. On the adjoining Dentonia property, significant historic production has come from similar veins. There has been little effective modern exploration on the Gold Drop property, and in the author’s opinion, the property is unique in this respect. It is reasonable to expect that veins on the Gold Drop property have similar strike/depth ratios as the nearby Dentonia vein, yet the limited drilling done on the property has generally failed to trace the veins to depth." Now it gets interesting (i.e. why this option agreement is so favorable for Ximen and its shareholders): Once GGX has obtained a 100% interest in the project after 4 years (in 2020), Ximen will have a right (for 9 months thereafter) to elect to form a joint venture with GGX by paying to the GGX the amount of money equal to 30% of the total amount expended on the property by GGX. If Ximen exercises this joint venture right, Ximen and GGX will enter into a joint venture for the exploration and development of the property. In other words: GGX is doing all the work, financing/dilution (i.e. taking the risk), and if the project becomes a success, it is Ximen who then has the decision power to get back 30% interest by paying just 30% of the costs that GGX spent. For this reason, I am a shareholder of Ximen (and not GGX). With less than 27 million shares issued and outstanding, Ximen has a tightly held share structure with less risk of future dilution as it receives annual cash payments from its optionees. According to CanadianInsider.com, Ximen‘s CEO, Christopher R. Anderson, increased his holdings from less than 3 million shares to more than 4.3 million shares last year. As per December 28, 2018, he also held 1.2 million warrants and 0.8 million options, thus, if all exercised, controlling around 6.3 million Ximen shares. According to Ximen‘s website, insider ownership / major shareholders account for 40% of the company (as of September 2018). In other words: Management and insiders have serious “skin in the game“, i.e. they put their money where their mouth is. New interview with Christopher Anderson, CEO of Ximen Mining Corp.